Now without further delay, I present to you the first ever winner of the Enlightened Horsemanship Through Touch Annual Guest Blogger Contest, Global Horse Culture: Horses and Humans Observed. Besides having a really cool masthead, girasol writes about masses of fascinating stuff. Go there regularly. Learn something new! Don’t forget to comment. Kemancho, a bay Arabian stallion, was standing in a large roundpen, head hanging, leg cocked in rest. His owner, Bonnie Roy, was busy dragging poles into the pen to mark out a small square in the center. That finished, she stepped into the square. The stallion awoke suddenly from his rest, launching himself around the edge of the pen, whirling his head, half rearing between strides. Only when I reviewed the tape later did I see the small gesture Bonnie had given to send him out around the pen. Now, watching more carefully, I saw her right index finger wagging slightly, counting the rhythm of the canter. Then her head cocked to one side and her shoulder leaned, and ChoCho (as Kemancho is fondly called), hit the brakes, doubled back, and cavorted off in the other direction. Now I was seeing her signals – the slight changes of body angle, the raised index finger, the slight lifting of the other hand, which held an coiled but unused whip. Bonnie was so still and centered in the pen, her movements so subtle, her voice an occasional short bark, while the stallion grew bigger and wilder as he raced around the perimeter, leaping and bucking. Just as I was beginning to think she had quite a bit too much horse on her hands, Bonnie suddenly brought her hands to her chest, in a martial arts gesture of respect. The stallion turned in, took two enormous leaps, and screeched to a halt a foot from her face. The two of them together turned shoulder to shoulder, and backed in perfectly matched steps. Then the stallion immediately returned to “resting” mode, with a calm eye, relaxed body, and gentle facial expression. He continued to stand there quietly while she walked away and opened the gate to the pen. Then he took off on her cue into a wild gallop and did two fabulous laps around his paddock, squealing to the nearby mares to make sure they had not missed the show. “You’re such a ham!” Bonnie exclaimed, shaking her head. 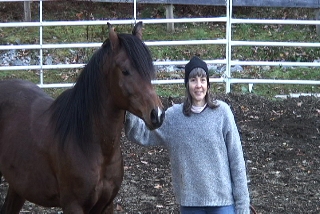 Bonnie Roy teaches her unique approach to horses from Alderlore, her mountaintop farm in Northwest Connecticut. After many years of experimentation, she has developed a systematic five-level method for teaching both horse people and non-horse people how to dance with her horses (or their own). Having spent many years as a serious practitioner of Tai Chi (the Chinese system of moving meditational exercises), Bonnie incorporates many of its principles and exercises into her approach, while also drawing on elements she has learned from other horse trainers. People who have never interacted with horses, she says, can find the experience quite overwhelming. They are intimidated or afraid at first, then thrilled to discover they can communicate with the horse through touch, energy, and posture, culminating in a choreographed “dance” in the roundpen. In the very first session, she said, people are often surprised and moved – sometimes to tears – by the quality of touch her horses offer them. The approach is more difficult, she said, for horse people, who are used to approaching horses only as a “trainer,” whereas she teaches how to cultivate an interactive partnership in which the horse brings its own energy and life to the dance. Nonetheless, she chuckles, all of her horses are taught the fundamentals a rider would expect them to know, so that should they ever need to be sold they would be able to work within a traditional training system. Bonnie’s first and oldest horse, Bob, is still with her. A gaited Morgan gelding, he was the horse she began Competitive Trail Riding with. He is now in his 30s. Also retired on her farm is her aged Thoroughbred. Her more recently acquired horses – the ones she uses in her current work – are all Arabians. ChoCho, the stallion, will be her new Competitive Trail Riding horse when he is older. He is only four, and is still developing as a riding horse. “I’ve always been successful with horses but not in a traditional sense,” she said, “because when I go in a traditional sense the whole thing is too structured for me…. Six years ago I started doing Tai Chi. I thought my God, the way you learn Tai Chi and how to control your energy: this is how you are successful with horses! When the horse is big you’re just there with them! And I thought there’s a match here.” Her explanation rang true for me, as many of us may have noticed the best horse trainers, in whatever discipline, have a deep quiet presence that seems to bring out the best in their horses. And many of us, as riders, have found our biggest struggles are with our own impatience and tension. I asked Bonnie how she had developed her specific five-level system for teaching. Besides her own experimenting and Tai Chi practice, she said, she also drew on the work of several other “alternative” trainers. 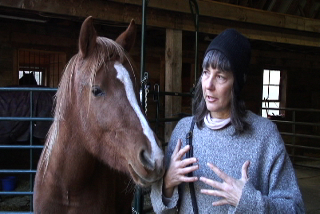 Carolyn Resnick, she said, sits with her horses, a technique Bonnie incorporates into the first level of her teaching. Russian trainer Alexander Nevzorov trains horses to do elaborate classical dressage movements using only a simple rope loop around the neck in place of a bridle. Bonnie incorporates this loop – which she calls the “cordero” – into her level two exercises (although she actually rides her horses in both bitted and bitless bridles). When I interviewed her, we stood in the paddock with the larger group of mares and geldings (ChoCho has a large adjacent private paddock). The horses gathered around us, gently sniffing our ears and necks, peering at the camera, and taking turns resting their heads against our shoulders. Her neatly landscaped paddocks are designed for “self-exercise” with natural features such as hills and rocky areas, groves of trees and sandy patches. The barn is open to the largest paddock, and the horses wander in and out of the large ground floor space, taking shelter there as they wish in bad weather. “I use horses to teach people,” Bonnie says. “The ultimate goal is for people to be able to work with a horse in a very immediate, deliberate way with no emotional baggage or projections. When we work with horses a lot of things come up with us: fear, anger, questions… goal setting.” Those feelings interfere with clear communication with the horse. When we learn to work without that baggage, we see that revealed in the way our horses respond. You can learn more about Bonnitta Roy through her website, http://www.alderlore.org. girasol, thank you so much. Look for your brand spanking new, autographed copy of the Ultimate Horse Behavior and Training Book in your mailbox in about a week. What a pleasure to have you here in my humble blog.